History in Asphalt:The Origin of Bronx Street & Place Names - When John McNamara was a young boy he walked the streets in his Bronx neighborhood and often wondered how the streets got their names. He began to ask the people in the area questions. He researched maps and books. When John was older, he traveled by bicycle, kayak, and auto to collect more and more information. He has since traveled to every street in The Bronx at least once. When he grew up, he met others who had similar interests. They formed The Bronx Country Historical Society. He kept adding to his collection. Many years went by until the new executive director of the Bronx County Historical Society persuaded him to compile his extensive collection of notes as a book. 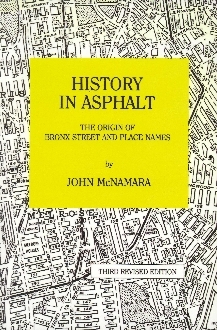 Eventually "History in Asphalt: The Origin of Bronx Street And Place Names" was published. People all around the country bought it, and it has since been revised and reprinted 3 times. In 1985, The City of New York bestowed a great honor to the penultimate Bronx historian and named John McNamara Square at Calhoum and Randall Avenues. The circle of history marches on.